We’d love your help. Let us know what’s wrong with this preview of Past Crimes by Ashley Gardner. Kat Holloway, a young cook who is highly sought after by the wealthy of Victorian London, becomes embroiled in murder and must clear her name. Only the mysterious Daniel McAdam, who is much more than he seems, can c Step into the past through three historical mysteries that reach from Imperial Rome to Victorian London. To ask other readers questions about Past Crimes, please sign up. A pretty good trio of mysteries. In the first, a female chef during the Victorian era finds herself under suspicion for the murder of her employer. A rogue seems to be her only hope of escaping the rope. In the second, a retired Roman gladiator and his companion try to find out who murdered a moneychanger. The third is about an adventurer during the Regency era trying to find out what happened to a diamond necklace. All of these stories do a good job of introducing the property's setting, character A pretty good trio of mysteries. This is a lovely tasting tray of three novellas that showcase three of the author's historical mystery series: Ancient Rome for one and Regency England for the others. I'm always happy to give new to me historical mysteries a try so I was eager to dive in and sample them all. I enjoyed this introductory novella to the series that showcases Regency era cook, Kat Holloway and enigmatic 'more than he seems' jack of all trades, Daniel McAdams work a clever mur This is a lovely tasting tray of three novellas that showcase three of the author's historical mystery series: Ancient Rome for one and Regency England for the others. I'm always happy to give new to me historical mysteries a try so I was eager to dive in and sample them all. I enjoyed this introductory novella to the series that showcases Regency era cook, Kat Holloway and enigmatic 'more than he seems' jack of all trades, Daniel McAdams work a clever murder in which Kat is the prime suspect. There was background on Kat and just enough a teaser to the characters to get the reader eager for the rest of the series. It worked. The characters were engaging and the plot good. I'm ready for more. A mystery set in ancient Rome was most welcome especially when the protagonist is a freed, retired gladiator named Leonidas and he must defend his innocence with the help of his bright and intelligent slave, Cassia. The author described the world so well and I loved both world-weary Leonidas who isn't impressed with his own fame and his exact and orderly Cassia. I can't wait for more mysteries in this series. Captain Lacey is called upon to locate a stolen necklace and get an innocent maid freed of the charges. What seems at first more of a pathetic domestic squabble between rival women turns into something more as a crime lord, a tarnished French aristocrat, and an angry husband all approach Lacey adding further developments. I enjoyed my first introduction to the Captain Lacey series set in post-Napoleonic War Regency England for wounded former cavalry-man trying to make his way in life. Three historical mysteries from author Jennifer Ashley (written under her pseudonyms). I really enjoyed this one! Our heroine, Kat Holloway, is a 28 year old cook who is highly sought after by the Ton and royals alike. When she is framed for a murder she didn't commit, the mysterious Daniel McAdam comes to her rescue and helps her to solve the mystery. I liked that Kat wasn't perfect, and that Daniel is not who he says he is. It m Three historical mysteries from author Jennifer Ashley (written under her pseudonyms). I really enjoyed this one! Our heroine, Kat Holloway, is a 28 year old cook who is highly sought after by the Ton and royals alike. When she is framed for a murder she didn't commit, the mysterious Daniel McAdam comes to her rescue and helps her to solve the mystery. I liked that Kat wasn't perfect, and that Daniel is not who he says he is. It made the mystery that much more compelling. I can't wait to read the next book in this series. How often do you find yourself reading about characters set in Ancient Rome?! Leonidas is a former gladiator who has won his freedom - and a slave assistant named Cassia - from a mysterious benefactor. A man who owed him money was murdered, and Leonidas is a prime suspect, but with the help of Cassia, he clears his name and discovers the true villain. You can tell that Cassia is just a slave in name only as far as Leonidas is concerned. He feels protective of her in ways he doesn't understand. Cassia herself is an anomaly. She's a slave, originally from a Greek family, that knows how to read and write and she is wicked smart as well. I will definitely be on the lookout for more in this series. While the writing is stellar, I didn't enjoy the plot or like the characters as much as the two previous entries. "Let the past stay in the past"
At first, this seemed a reasonable method of introducing readers to the attractions of historical novels. Take three widely differing eras and produce examples/excerpts to encourage people to purchase one of the series. I don't profess to understand why this author felt the need to write under different names? That's just confusing, as the writing style in all three stories was clearly by the same hand. Historical fiction isn't everyone's cup of tea. The books need "Let the past stay in the past"
Damn you- I specifically did not want to get pulled into another series... What harm could these novellas do? Now, here I am , realizing I have plenty more to read. The characters are incredibly developed, the atmosphere described so perfectly that I lost myself in it all. Well done!! Three historical novellas in this trilogy. The first set in Edwardian/Victorian London, the second set in ancient Rome and the third during the Regency period, also in London.The quality of the stories varied considerably in my opinion. The first, about a cook was awful! The characters were cliches of their time: the butler stealing the silver, a single parent cook, struggling to survive and a master who bullies everyone (yawn!). The hero, who we never seem to know anything about, is able to obt Three historical novellas in this trilogy. The first set in Edwardian/Victorian London, the second set in ancient Rome and the third during the Regency period, also in London.The quality of the stories varied considerably in my opinion. The first, about a cook was awful! The characters were cliches of their time: the butler stealing the silver, a single parent cook, struggling to survive and a master who bullies everyone (yawn!). The hero, who we never seem to know anything about, is able to obtain seemingly everything at will in half an hour and expects no payment (even out of season fruit and veg) and this is frankly absurd! and from that moment on, I found the whole scenario ridiculous. The second, and the best story, is about a 'Freed' Gladiator called 'Leonidas' (named after the Spartan King at Thermopylae) and his slave 'Cassia'. who endeavour to solve the murder of a money-changer. I felt this story was historically accurate and led to the characters being believable and the plot then lends itself to the intricacies of Roman life. His skill as a Gladiator are put to good use and his reputation precedes him in his (and Cassia's) quest. As you can tell, I quite enjoyed this story. The third, about a former cavalry officer endevouring to find a missing necklace, was okay but a disappointment after the previous story, which was a shame. The plot line needed more and I felt the understated Lesbian relationship between the two female protagonists and they're relationship to the master of the house (wife and mistress) who again is cast a 'Bully' was straight out of a Victorian Melodrama . Yes, the plot was weak and the ending lacked any drama or tension. Enjoyed the three mysteries very much. The first book was interesting, even if a little confusing. Perhaps later books will define Daniel more fully. The whole thing with the sugar caster was most confusing. I got that the arsenic was on the outside of the sugar caster, but the switching of the casters scenario was confusing. Particularly when one was buried in the planter and the other ?. A little too discombobulating for me. May look into this series further in the future. The gladiator story b Enjoyed the three mysteries very much. The gladiator story being my favorite. Will be looking into further books in that series. I say it is my favorite because I have read all of the Capt. Lacey Regency series and enjoyed every one. In fact, I absolutely love Capt. Lacey. Fell in love with him in the first book and remain that way to date. So, the Gladiator story was new and is the only reason it overshadowed the Capt. Lacey story in my mind. I read and thoroughly enjoyed The Hanover Square Affair, so I was excited about this collection of short stories. I liked the Kat Holloway mystery, "A Soupçon of Poison," and thoroughly enjoyed "The Necklace Affair," which brought back the Captain Lacey of "The Hanover Square Affair." In the first, Kat is suspected of murder and has to figure out how to clear her name. In the latter, Captain Lacey is asked to help find a missing diamond necklace .. and winds up embroiled in far more complications I read and thoroughly enjoyed The Hanover Square Affair, so I was excited about this collection of short stories. I liked the Kat Holloway mystery, "A Soupçon of Poison," and thoroughly enjoyed "The Necklace Affair," which brought back the Captain Lacey of "The Hanover Square Affair." In the first, Kat is suspected of murder and has to figure out how to clear her name. In the latter, Captain Lacey is asked to help find a missing diamond necklace .. and winds up embroiled in far more complications than he expected. The third tale, which is the middle one in the book, was "Blood Debts," featuring a gladiator called Leonidas. He's out trying to collect monies owed to him and comes across a dead body -- and is, of course, a suspect. Honestly, this one left me a little cold. It wasn't about the period (I know quite a bit about it) or that it was poorly written. It just wasn't my particular cup of tea. All three novellas are well written, absorbing and fun the read. Of course, spending time with the wonderful Captain Lacey is always a treat, but getting to know Leonidas,a retired 1st century Roman gladiator was also an unexpected pleasure. And, while Kat Holloway doesn’t enthrall me quite the way the good captain does, I still like her story and that of her friends. One if the great strengths of Ms. Ashley’s work is her character development fir both main characters as well as secondary characters. I feel like I could pick any one of them out of a line up. I think Captain Lacey and Leonidas share many of the same endearing personality quirks and insecurities as well as a pretty well developed sense of honor. I think Leonidas suffers from a higher degree of PTSD and depression than Gabriel Lacey but by golly, I really like him and can’t wait to read more of his story. Jennifer Ashley / Ashley Gardner is one of my favorite writers. The characters are authentic with positive qualities as well as faults. The times in which the characters live are so thoroughly researched one can almost hear the street sounds & smell the cities of each respective story. I'm already a fan of the sometimes cranky Capt. Lacey. Kat is a new favorite character. I look forward to reading her 2nd novel. And in Leonidas we are treated to an unusual hero. A freed gladiator in Nero's Rome with a compassionate heart. I can't wait for his 1st full length novel. I highly recommend this book as an introduction to these wonderful characters for mystery lovers. I loved these three well-researched, period pieces! Each historical tale of mystery covered a different era; and introduced a different protagonist; but all were complete stories. They do not leave you hanging at the end, nor do they require prior knowledge of the main characters. Ms. Gardner is an excellent writer, who deftly weaves captivating plots, likable characters, diverse crimes, and puzzling clues into three intriguing cases that will draw you in and keep you reading Three Great Stories! I had already read the short story for Captain Lacey, but the Kat Holloway and Leonidas the Gladiator were both new to me. And I loved them! Unfortunately there seems to be only 2 Kat Holloway and 1 Leonidas books out so I've some waiting time ahead of me. The Kat Holloway was an easy one to like and it helped that I had just read "Pompeii, A Living City" just prior to reading the Leonidas story. They both take place around the same time period so I had some background info fresh in my mind. I loo I had already read the short story for Captain Lacey, but the Kat Holloway and Leonidas the Gladiator were both new to me. And I loved them! Unfortunately there seems to be only 2 Kat Holloway and 1 Leonidas books out so I've some waiting time ahead of me. A novella to peak interest in a new mystery series - and it worked for me!! I an interested in reading more about Kat and Daniel. As with the author's other mystery series, the story is told in the first person. Sometimes this works, sometimes it doesn't. As with the Captain Lacey series - the first person in this novella works!!! Beautiful cook, attractive mysterious man (a spy?) and the man's "son" all take part in a murder mystery. Lots of suspects. Murderer found. A romance is cooking. No one seems to be as they seem. Descriptions of food. Can't wait until the first book of the series comes out!! HOLLYWOOD CALLING: would make a good TV series - just saying. I was afraid that this novella would not have the nuance of this series of books, but it is all here. Grenville's anger, Captain Lacey's depression just on the surface, mobster Denis' involvement in the ongoing mystery of the book, it was all there. This series of mysteries is just fun to read. Best part of book was a letter to Captain Lacey from a friend helping him which gave him a lot of information needed to solve the mystery. Lots of favors granted and not granted. A mobster running Parliament, really? Love it!! And the first page of chap 10 tells it all!! BEST USE OF: Riding in carriages. Soirees. Wearing your best suit. SPUNKY HEROINE: There is none. 0 - Only from the fireplaces. A retired gladiator trying to survive. I really liked this one. I might pick up the fi 3.5 stars. A retired gladiator trying to survive. I really liked this one. I might pick up the first book of the series. Like any anthology the stories vary enough that I cannot give it a single rating. I have read all (to date) of the Captain Lacey mysteries and love them, so they are different 4 or 5 stars. The Kat Holloway are new to me and I enjoyed this one tremendously, also 4 or 5 stars. The gladiator Leonidas, however, probably should not have been unearthed; the characters are great but the brutality of the time period is atrocious and nothing I want to spend my reading time on....2, maybe even 1 star. This book consisted of three stories set in the past, each with a different set of characters. The story set in the Victorian Britain was my favourite. I had read about captain Lacey before and enjoyed it. I did not so much enjoy the story set in Ancient Rome about the retired gladiator. I liked the idea and the character, but somehow the story did not hold my interest. The final story about a cook in a Victorian home was also enjoyable. Ms. Gardner is a "new to me" author and I found this book to be a great introduction to her historical mysteries. I really enjoyed reading all three of the short stories. Ms. Gardner's narrative made me feel as if I was with the characters as they walked their cities, talked to their friends or enemies and unraveled the mysteries. I look forward to reading more of Ms. Gardner's books. This author invariable presents fine well planned and well written novels. This compendium introduces two original prequels of lesser known and developing series which I hope to follow up on soon. I love mysteries, always have and the idea of historical mysteries did catch my eye when I saw the title of this book, but despite the time periods I didn't find anything memorable about these stories. Past Crimes fell flat for me - a good mystery should draw you in and hold your attention to the very end and that just doesn't happen here. The author has written a very interesting stories that take very interesting and unexpected twists and turns that is sure to keep the reader totally entertained. This was a collection of three novellas. Two were from the Victorian period and one was from early Roman times. Certainly gave me a different perspective than I have become accustomed to. Enjoyable light read. 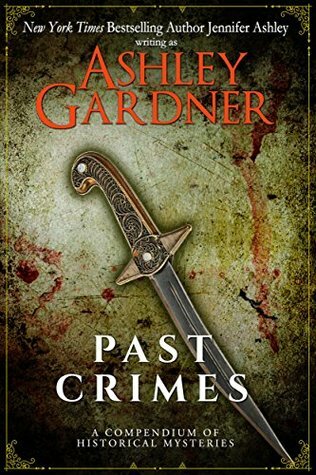 Each book of "Past Crimes" was better than the last it seemed. Each twist in the tale was intriguing. I think I will now have to read the whole Captain Lacey series of books! What a great combination! To combine a well written mystery that takes place in an historic period. A very enjoyable read and a great way to introduce the various characters in each time period. Definitely made me want to read more!